Do you want to lose weight, or do you want to keep muscle and lose fat? A diet can help you lose weight, but you can use body composition exercises to keep the muscle along the way. It's not as complicated as it sounds. You just have to combine body composition activities with a diet full of lean protein to encourage weight loss and and shape a stronger body. Body composition is your body's ratio of fat to lean mass, including muscle, bones, and organs. Body composition is evaluated using body fat percent. A fit woman's percent body fat generally falls between 21-24%. A fit man's body fat generally falls between 14-17%. If you want to change your body's shape, you'll want to decrease your body fat percent. Surprisingly, this could mean an increase in your weight. This is because muscle weighs more than fat. As you lose fat and gain muscle, the net result may be a small increase on the scale. All forms of exercise burn calories. But body composition exercises and body composition workouts combine activities to burn fat and activities to build muscle. That way, as you slim down, you replace fat with lean, tight muscles that give your body a stronger appearance. So what is the best way to burn fat? Aerobic exercise will do the trick. Aerobic activity, sometimes called cardio, is an exercise that gets your heart pumping. During an aerobic workout, you'll breathe heavier and begin to sweat. It is not necessary, however, to exercise to the point of breathlessness every day. In fact, you'll burn the highest percentage of calories from fat at a moderate intensity. As your fitness level improves, however, you may want to include harder workouts in your exercise schedule. Higher intensity workouts burn more calories, but a smaller ratio of fat. To maximize fat loss, combine high intensity, moderate intensity, and low-intensity workouts into a complete and balanced fitness program. You'll notice real changes to your body composition when you begin strength training. The purpose of strength training is to build and shape the muscles. A common misconception among women is that strength training will cause them to bulk up. This is rarely the case. Women don't make enough of the hormone testosterone to build the muscles that a man might build doing the same workout. You also don't need to worry about having special equipment. There is no need to spend a lot of money or join a gym. 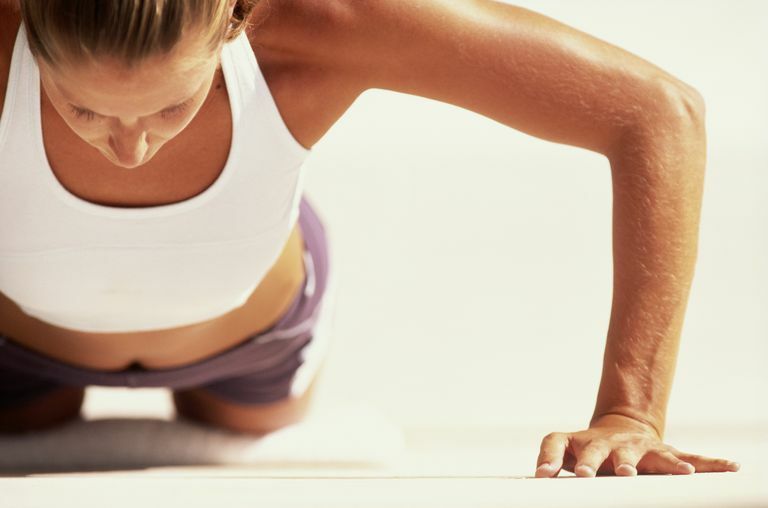 You can do simple strength training workouts at home to strengthen your legs, arms, and abs. So which exercises are best when you're trying to change your body composition? Simple body weight exercises are effective because they increase your heart rate (aerobic exercise) and build strength to shape strong muscles at the same time. These are examples of exercises you can do at home with little or no equipment to shape and tone your body. If you are consistent in your training, you should be able to start to notice changes to your body composition in just a few weeks. So how do you build a consistent program? You can combine aerobic workouts and strength training workouts into a circuit workout or you can alternate workouts on different days to make sure you stay consistent. Circuit training. Combine your favorite cardio activity with strength training and alternate each activity within a single workout. For example, if you like to walk you might get on a treadmill and climb a hill for 7 minutes then follow up with 3 minutes of push-ups, lunges, and abdominal curls. Repeat that pattern three to six times for a complete circuit workout. Alternate days. You can also burn fat and build muscle by alternating workouts on different days. For example, you might choose to take an aerobics class on Monday, Wednesday, and Friday and complete your strength-training workout on Tuesdays and Thursdays. Try not to schedule strength-training days on consecutive days as your muscles need time to recover. Don't forget that your diet plays an important role as well. Make sure you monitor your energy balance to get the deficit you need for fat loss to occur.